Grilled Brussels Sprouts are bathed in a quick balsamic marinade before cooking on a hot grill for flavor and sear! 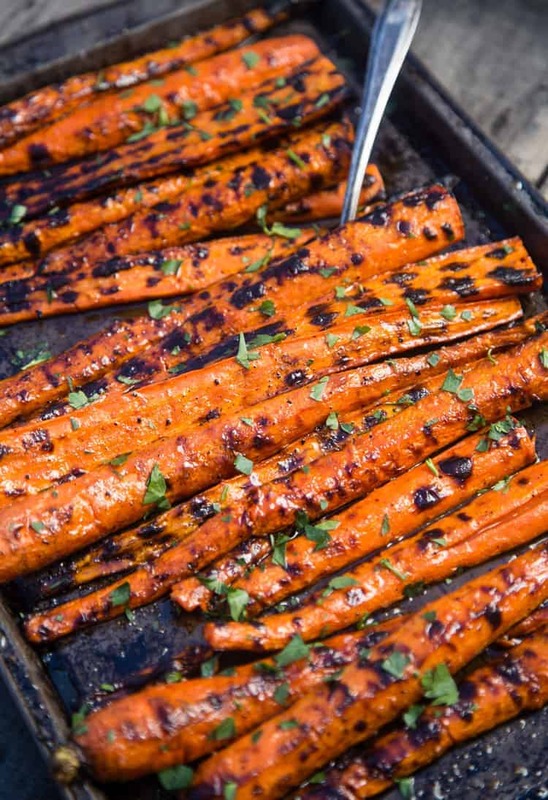 This is the ultimate vegetable side dish for your grill! It’s also a fan-flippidy-tastic dish to add to a holiday dinner for all you grilled food lovers out there (hi, nice to meet you!!). 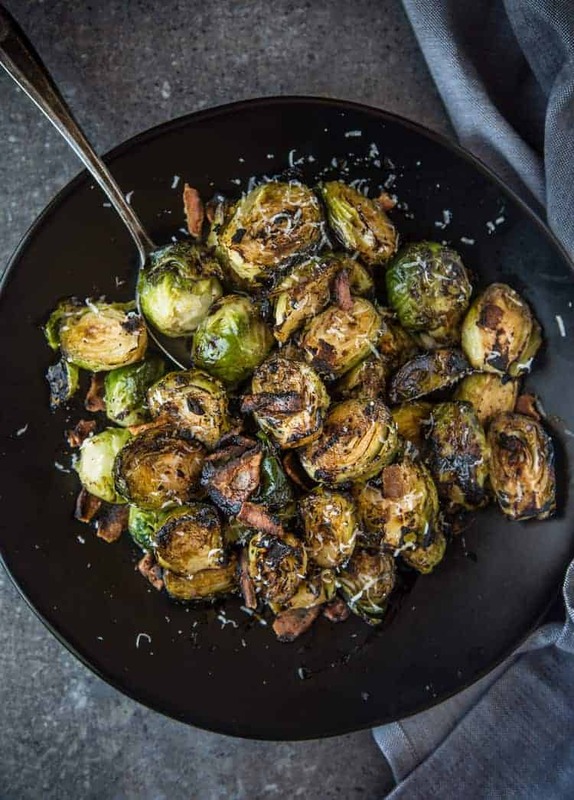 Grilled Brussels sprouts are are a unicorn recipe for my family — as in a family full of boys who all hate vegetables (I’m talking to you, Sean!). The 8-yr olds, ok, I’ll cut them some slack (we’re working on them). But the adult man in his 40’s? Yeah, he should be more vegetable flexible in my book. But he’s not! It’s my mission to change that. My husband loves them. I mean, it’s one of 2 vegetables in all of the world that he actually gets excited about (asparagus is the other). He’ll eat them any way they’re prepared (roasted, steamed, raw, shaved and in a salad, you name it). 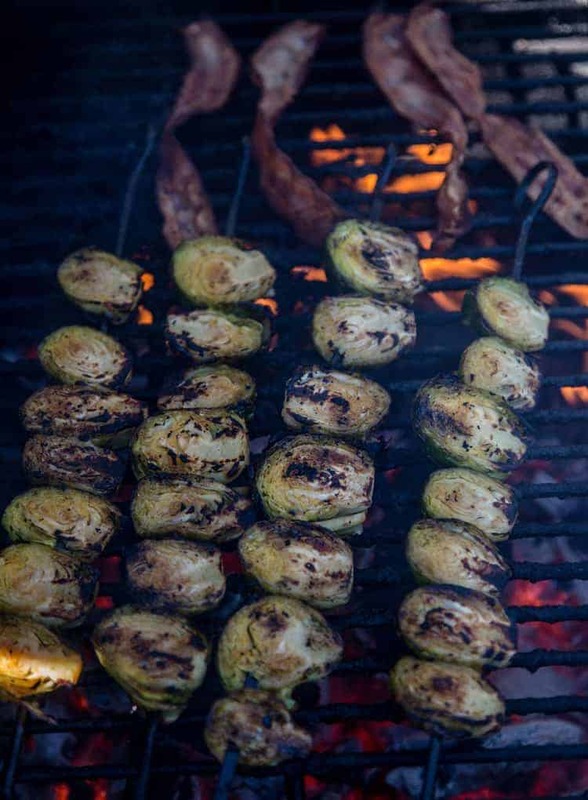 And while roasting Brussels sprouts is pretty darn delicious, grilling them is even better! And it doesn’t hurt to add a little grilled bacon. Just sayin’. Oh wait, perhaps that’s why this recipe won him over for life? 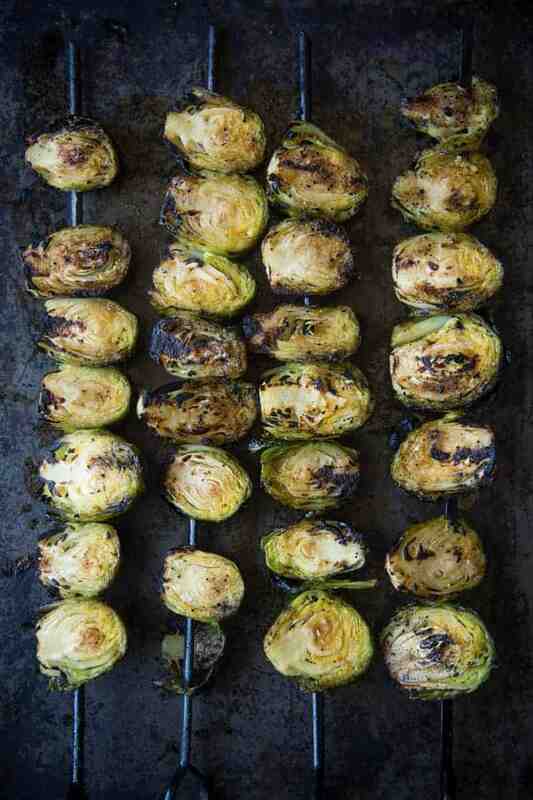 Unlike some veggies, ya can’t just throw raw Brussels sprouts directly on the grill. Well, I suppose you could, but the outside leaves will burn, while the inside is undercooked and firm. It’s best to soften them first. You can soften Brussels by microwaving them, like here. But we’re better fans of either steaming them or par-boiling them. This is strictly just to soften them a bit, and get them ready to go on the grill. For these, we trim the rough ends off the Brussels, steam them for 5 minutes, then put them in an ice bath (to stop the cooking briefly). Then place them in the balsamic marinade, skewer them, and throw those bad boys on the grill! I like to skewer. While it may seem like work up front, it’s easier once they’re on the grill to get the perfect sear on them if they’re skewered. This is also why I like to cut them in half first too. Grill one side, get a nice sear, turn again, get a nice sear. Boom, you’re done! Time to eat those delicious morsels of vegetable deliciousness. What about the grilled bacon? Yes, the bacon! I’m not a huge fan of wrapping bacon around the Brussels because it doesn’t get as crispy as I like it (and I prefer crispy bacon). I cook the bacon on its own, over indirect heat until it’s crispy to my liking. Once it’s crispy, remove it, let it cool enough to handle, and crumble it up to top over your Brussels sprouts when you serve them. You can serve them direct from the skewer, but I prefer to remove them from the skewers and place into a serving bowl. Then, toss in bacon, parmesan, and eat. Feel free to add a drizzle of aged balsamic vinegar if you have it. It’s pretty decadent on top! 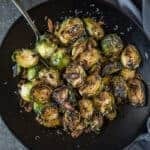 Grilled Brussels Sprouts are the ultimate vegetable side dish! 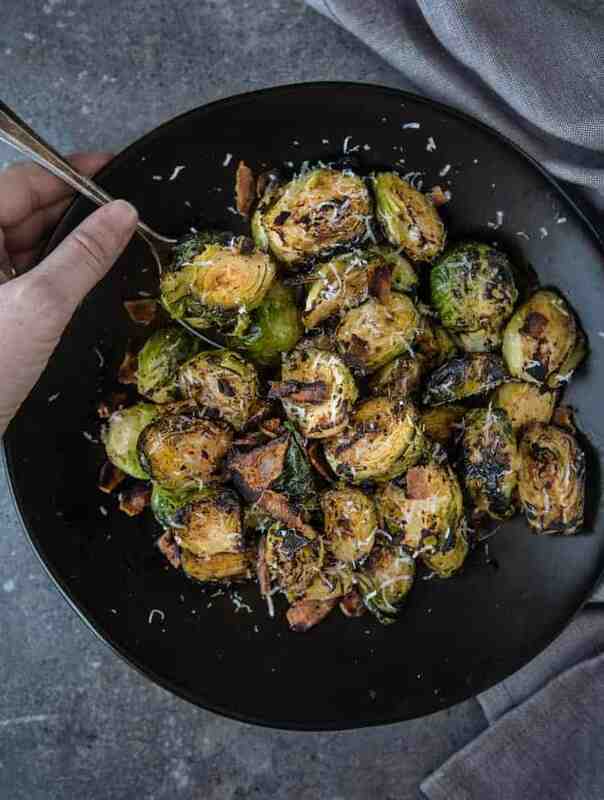 When you add bacon and balsamic to your Brussels this grilled side dish is over-the-top. Trim off the rough stem from Brussels sprouts. Steam Brussels for 5 minutes, remove immediately and place into an ice bath to cool. In a medium size bowl combine olive oil, balsamic, honey, lemon juice, Dijon, garlic, and dry rub. Whisk to incorporate and add to a 1 gallon baggie. Remove Brussels sprouts from ice bath, cut the Brussels in half, lengthwise, and place into the marinade for 2 to 4 hours. Remove from marinate, and then skewer. Prepare grill for direct/indirect cooking method. Place bacon on indirect side. Bacon has lots of fat, and it will potentially cause flare ups over direct heat. Cook the bacon on indirect for up to 12 minutes or until crispy. Remove from grill and dice. In the meantime, place Brussels skewers on direct heat. Rotate sprouts over direct heat every few minutes until nicely charred on all sides. About 5 - 6 minutes total time, will vary based upon size of flame. Remove sprouts from the skewer, place in a large bowl, and glaze one more time with remaining balsamic marinade. Top with bacon and the parmesan and serve. I will make these for sure! We love brussels sprouts at my house , but haven’t tried them on the grill yet. Definitely going to have to try these too! I’m with Sean – Asparagus, Broccoli and Brussels are the few veggies that I really love. We love Brussels sprouts at my house! The mixture of honey and balsamic in this glaze sounds lovely!